Paris is one of my favorite places in the world! Whether you're traveling on a budget or throwing caution and cash to the wind for your trip to the City of Light, it's got something for everyone and can be enjoyed under just about any circumstances. 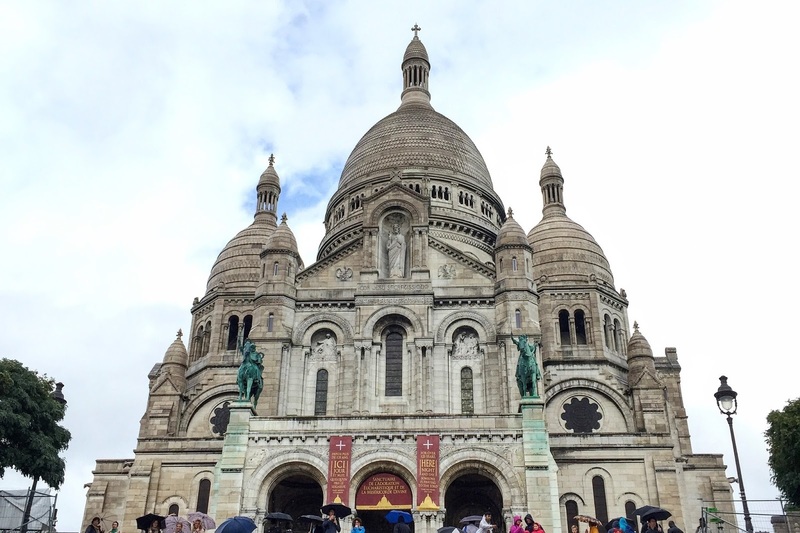 While I was giving some travel recommendations to a friend who's planning a trip to Europe it dawned on me that many of my favorite things to do in Paris are free... It's hard to beat a bargain like that, even if you are facing a hefty exchage rate. Without further ado, here are 8 wonderful things to do in Paris that won't cost a dime! 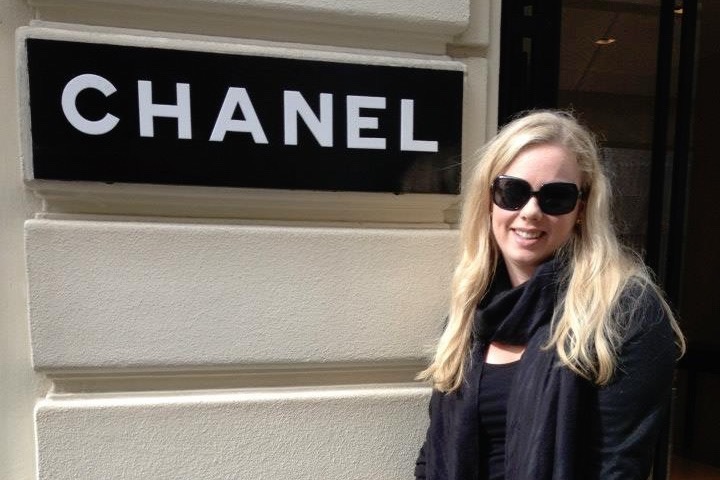 While coming home with a piece from the legendary French design house Chanel could quite possibly break the bank for many, visiting the original Chanel at Rue Cambon is completely free. Though you may only be able to go inside the Chanel store at 31 Rue Cambon, it is indeed the building that houses the apartment where Coco Chanel herself lived for a time as well as the famous mirrored staircase where she used to hold fashion shows. If you're lucky as I was, you may get a chance to see the staircase, a priceless sight for anyone who loves fashion, but if not, there's something rather moving about knowing that you're standing in the place where Coco might once have stood, looking at the legacy she built and left behind... While you're there, if you're not on a budget, then by all means, treat yo self! 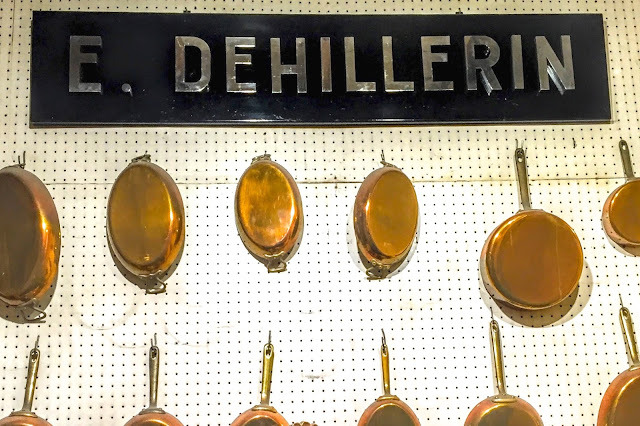 Foodies and anyone who loves to cook or grew up watching Julia Child on television will rejoice in a visit to E. Dehillerin, the cooking shop where Julia herself bought many of her kitchen items while she lived in Paris. Don't go to this iconic store expecting the shiny, bright displays you may find in the homewares section of a department store... This place is packed to the roof and can only be described as rustic. That said, the staff are lovely and welcoming and you'll find almost anything here... Looking for a seahorse mould? You'll find it. Need a wooden spoon that's 6 feet tall? You'll find that too! Even if you don't need anything, if you read My Life in France by Julia Child (and I highly recommend that you do - it's a wonderful book! ), you'll feel as though you've time-warped to post-war Paris where you're living out a page or two of that beautiful memoir... It's well worth a visit, even if you're not interested in food, just to see what must be the world's largest saucepans (or darn close to it)! No trip to Paris is complete without a trip to the famed Notre Dame Cathedral. 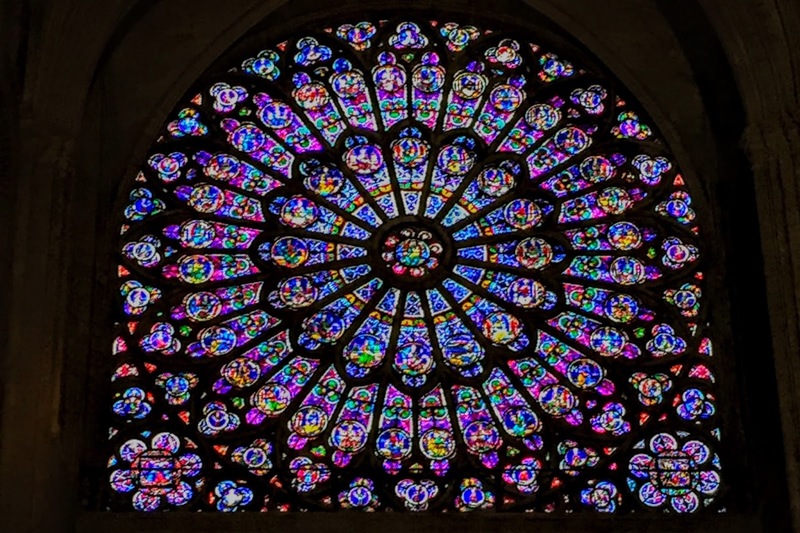 Whether you're a fan of architecture with an interest in flying buttresses and rose windows, looking for a religious experience or simply a fan of The Hunchback of Notre Dame, this is not your average church. Beautiful from the outside, Notre Dame is a great place to hang out on a sunny day, with beautiful gardens where you can sit on a park bench, read a book and take in the scenery. A few times while I've visited, there has been a man outside that I would say is as magical as Burt in Mary Poppins who could only be described as a bird feeder. He'll give you a bit of bread and all the birds will storm your hand - it's amazing, although that's not entirely free... You should of course give him a Euro or two if you take his bread. There may also be accordion players and other street performers around to enjoy. If it's not sunny, waste no time and go straight inside. Entry is free and it's well worth the time to see the beautiful rose windows inside and take in the beauty of the cathedral. 4. More Chanel... And Givenchy, Dior and Saint Laurent, oh my! 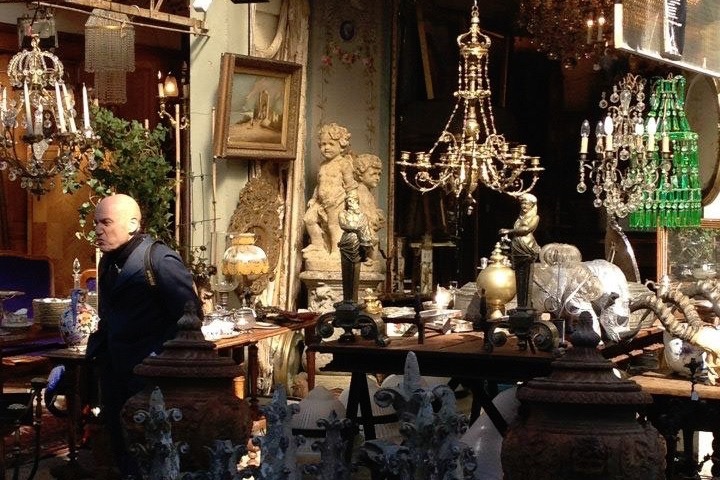 The Paris Flea Market is a sight to behold... Truth be told, I spent a whole sunny day there and I didn't spend a dime on anything except a Diet Coke and a crepe. This is mostly because the prices have gone a bit crazy since vintage is no longer a secret. Don't let that stop you from going though... If you love fashion, antiques or film history, you will feel like you're in a museum. Seeing rooms full of Audrey Hepburn-worthy Givenchy dresses from the 1950's and 60's is a sight to behold, even if you don't plan on buying them! My husband enjoyed looking at old clocks and watches. We also saw some amazing music finds alongside film memorabilia - I very nearly bought a French language Gone With the Wind poster, but I'd have never gotten it safely back to the hotel. If you're visiting, you may have to walk through a lot of venders selling knock-off handbags and Nike shoes, but don't fret... Before you know it, they will be gone and you'll be surrounded by vintage Van Cleef & Arpels, beautiful antique furniture and all the vintage Chanel bags you ever could've hoped for! 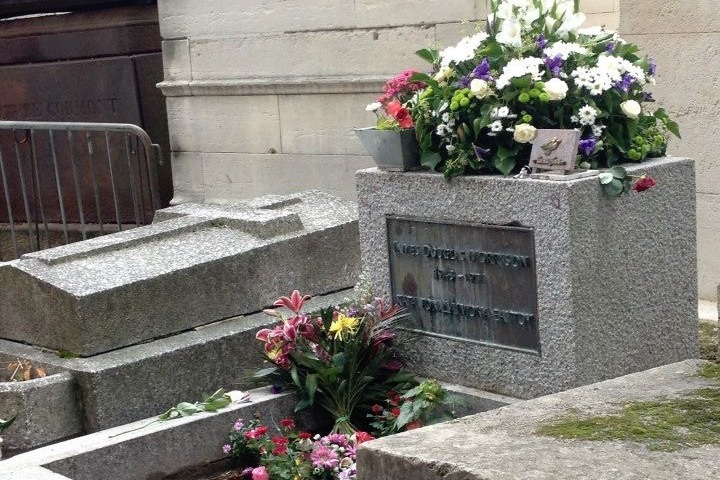 The Père Lachaise Cemetery may sound like a morbid place to visit if you're not familiar, but it's famous for being the burial sight of Jim Morrison from The Doors. 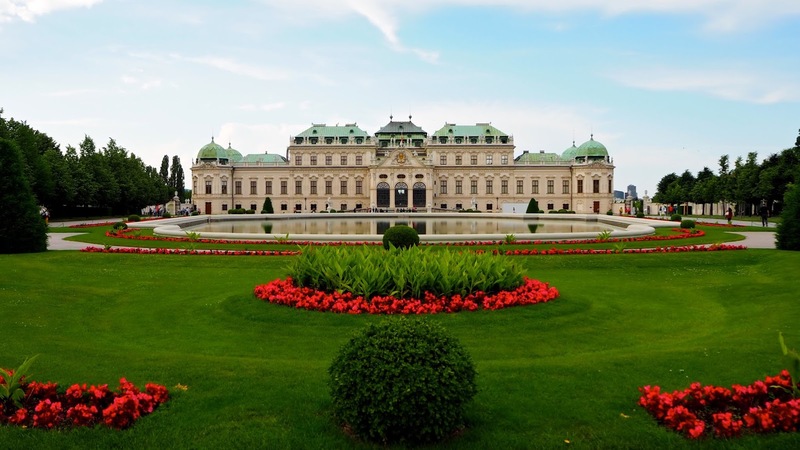 Many other famous people, mostly of political or artistic notoriety, are buried there too including Honoré de Balzac, Frédéric Chopin, Oscar Wilde, Maria Callas, Édith Piaf and Marcel Proust, to name a few. Free to enter, this cemetery will blow your mind... It doesn't look like the average burial ground with its ornate tombstones and sculptures. Prepare to spend a few hours walking up and down hills if you want to see a lot and be sure to bring a bottle of water with you. There are maps available so you can visit the graves you're interested in. If you have time before you jet off to Paris, it's worth watching the documentary Forever by Heidi Honigmann, a film that documents the visitors to the cemetery, many of them on a pilgrimage to pay their respects, leave gifts and flowers or even to maintain the graves of various notables, some of whom have been dead for more than 100 years. It will give you some background to think about before visiting Pére Lachaise yourself. Outside the Centre Pompidou, a popular modern art museum is the Fontaine Stravinsky, the most whimsical and fun fountain I've ever seen and thought by some to be one of the most photographed fountains in Paris. 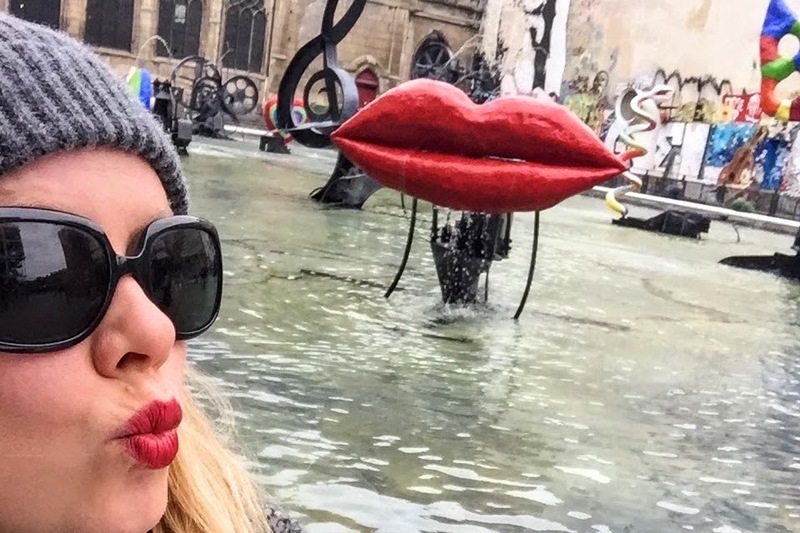 Representing the musical works of Igor Stravinsky, this famed Parisian landmark is not actually one, but 16 individual fountains all living in the same shallow pool of water. Each individual fountain moves and sprays water, representing different sounds and works of the composer. I found this fountain by accident while I was wondering around through the streets of Paris, but you can add it to your plans and if the weather is decent, it's a lovely spot to spend a few hours. There's a Starbucks right there if you need coffee or to charge your phone and the shops nearby are lovely. Of course, if you want to visit the Centre Pompadou, you totally should, but beware that queues are long, it's not free and it would be advisable to book tickets ahead of your visit. Overlooking the entire city like a big, beautiful guardian angel in Montmartre is the Basilica du Sacre Coeur, which translates to Church of the Sacred Heart. There is a funicular train that goes up the hill to the church for a small fee, however those who are brave, super fit or on a stiff budget can of course take the stairs for a nice little workout that will be well rewarded with the best view of Paris. You'll also find street artists all over the place and if you're keen for a real experience, go in the evening for the most beautiful sunset over the city. Walk around the left side of the church to find a whole new area of souvenir shops, restaurants and market stalls worth exploring. If you like, you can walk that way and head back down the hill to Montmartre to enjoy any of the restaurants or shops along the Rue des Abesses. No matter how you choose to do this jaunt, it's worth it to see the beautiful basilica up close and enjoy the most breathtaking view of the City of Light. 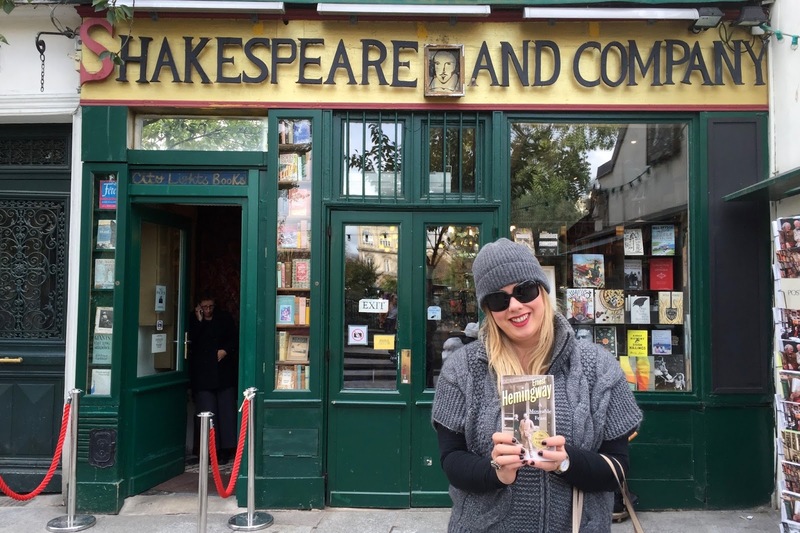 Saving the best for last, I can't say enough about Shakespeare and Company, one of my favorite places in the world. 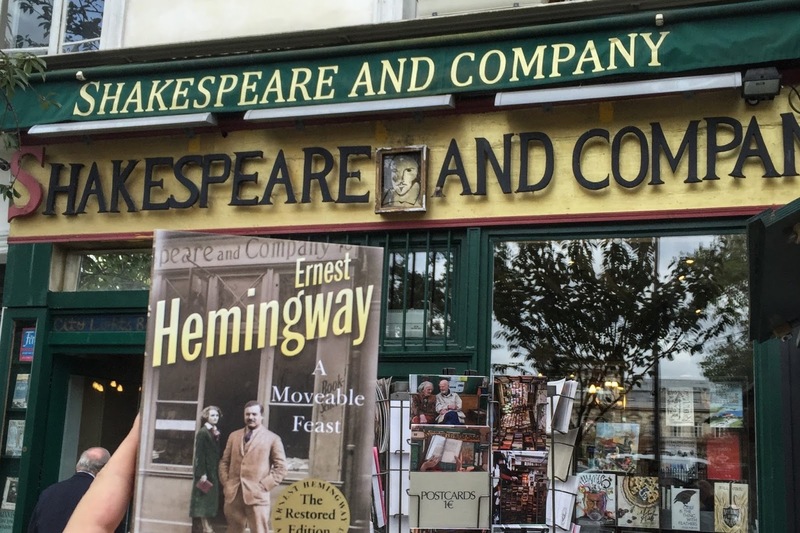 Though the original Shakespeare and Company, owned by the American-born Silvia Beach until it closed in 1941 during the German occupation of Paris, was at a different location, it doesn't seem that way when you lay eyes on this iconic bookstore in the Latin Quarter. Featured in films like Midnight in Paris and Before Sunset, this is not your ordinary bookstore. Shakespeare and Company sells books in English, but has a unique history that goes far beyond the language of the publications inside. Formerly a gathering place for writers of The Lost Generation including Ernest Hemingway, F. Scott Fitzgerald, Gertrude Stein and Ezra Pound to name a few, the original shop was also at one time used by James Joyce as his office. Books that were banned in the United States and the UK, such as the scandalous Lady Chatterly's Lover could be bought or borrowed there. The store's owner Sylvia Beach even published Ulysses after it was banned in both the USA and Britain. Customers of the new Shakespeare and Company have included the likes of Anaïs Nin and Henry Miller. Notes have been written and left all over the store and there are little nooks with typewriters where one might come and work on their novel. If you look hard enough, you might spot a note by me written on my business card... It's completely free to visit and if you do, you may find a discussion going on upstairs about a new book as they host events and chats regularly. I happened in on one while I was there recently and it was fascinating. Books of all types line the shelves and should you be tempted, they will stamp the inside of the book so you'll have it as a memento of your visit. I chose to purchase Hemingway's A Moveable Feast, a book that features the store on both the cover of some versions and within the story - it seemed appropriate. Whether you're traveling to Paris on a shoestring or enjoying a luxury tour of the city, I hope you'll find as much joy while you're there as I do every time I visit. It's a magical city that will give you a new lease on life if you let it. With things to see, do, eat and enjoy for every type of budget, the City of Light never disappoints and will leave you feeling inspired and recharged for months to follow. Bon voyage! I love this post! I've only been to Paris once, so I did all of the expected tourist stuff. I missed out on Oscar Wilde's grave before they covered it in perspex to stop people kissing it, which I'm gutted about. And that flea market looks amazing!